jammu style rajma masala recipe is a delicious curry made with dark red kidney beans in an onion-tomato-spice base. rinse and then soak 1 cup kashmiri rajma in enough water overnight or for 8 to 9 hours. next day, drain the water. then rinse the soaked rajma very well in running water. add the rajma in a pressure cooker along with ¼ teaspoon salt and 2 cups water. you can also skip the salt if you want at this step and just cook the rajma beans with the water. pressure cook the kashmiri rajma beans for 16 to 18 whistles or for 18 to 20 minutes on a medium flame. the time taken for the rajma beans to cook depends on the age and quality of rajma. when the rajma is cooking, take the whole spices mentioned above (in the ingredient list) and keep aside. also roughly chop the onions and tomatoes. in a grinder jar, take the chopped onions, tomatoes and all the whole spices. grind to a smooth fine paste without adding any water. keep the masala paste aside. when the pressure settles down in the cooker, check the rajma beans, if they have softened. they should be cooked completely and should not have any firmness or bite in them. if the rajma are not cooked completely, then pressure cook for some more time. melt 2 tablespoons ghee in a pan. you can also add 3 tablespoons ghee. once the ghee melts, switch off the flame then add the ground onion-tomato-spice paste. this mixture splutters a lot, hence the burner can be switched off or kept on sim or low. then cover the pan with a lid and switch on the burner. keep the flame to a low. on a low flame cook till the masala stops spluttering. do check when the masala is getting cooked, so that it does not stick to the base of the pan. when the mixture has stopped spluttering, then remove the lid and add 1 teaspoon ginger-garlic paste. next add ½ teaspoon kashmiri red chilli powder and ½ teaspoon coriander powder. mix everything very well and saute the masala till you see ghee releasing from the sides. saute on a low or medium-low flame and stir often. the masala should thicken, leaves sides of the pan and you will see ghee being released at the sides. once the masala is sautéed well and you see ghee at the sides, then add the cooked kashmiri rajma beans along with its stock - the water in which the rajma beans was cooked. now add ½ cup water. you can add water as required. mix again. on a medium flame bring the rajma curry to a boil. also mash some rajma beans. this will help to thicken the rajma curry. the consistency of the rajma curry should not be watery or broth like. it should be smooth and have a medium consistency. switch off the flame. 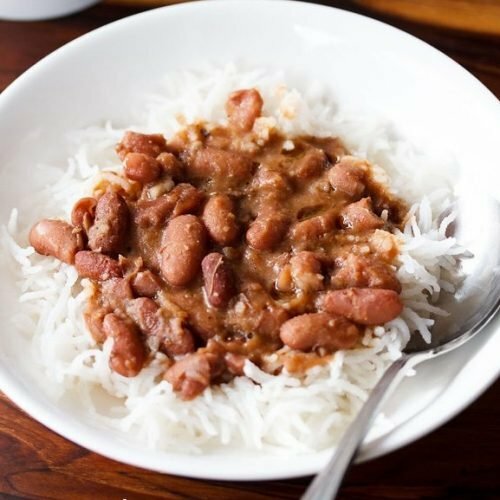 serve jammu style rajma masala on a bed of steamed rice and top with some ghee. if you want you can garnish with some coriander leaves.